Easy to grow plants with daisy flowers throughout summer. They are mostly mid tall at around 3ft - 3ft 6in / 90 -105cm but best kept bushy by pinching out shoots in spring - or do the Chelsea Chop in late May. If this is done they require little staking except in the most windy sites. Cut down to ground level in autumn. Propagate by seed or division although seed raised plants may be variable. 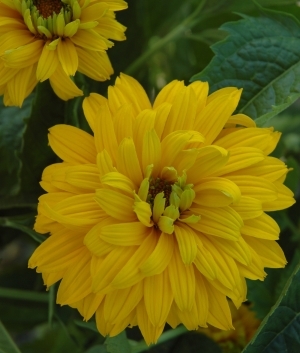 Suitable as a cut flower if lateral buds not showing colour are removed. A member of the Asteraceae family from North America. Large, elegant single flowers about 2ft 6in / 75cm tall. Flowers from late July onwards well into Autumn. Large, golden, double flowers about 2ft 6in / 75cm tall.